Today's edition is brought to you by Dan. He noticed that I had yet to post something. Thanks love! You are the best! I'm not totally sure he wants me to post this but I'm going to. Carly is growing by leaps and bounds. I can't believe that she is 18 months old already. One of her newest things is "cheers". Every time time she has a cup, she'll hold it up and say "chees" - her version of "cheers.". This morning we cheered our milk, pancakes, and a Winnie the Pooh bear tin that holds a couple of Leah's card games. Here she is riding her inchworm she got for Christmas. Cute, isn't she? 2. Carly is obsessed with baby dolls (she calls them na-na's) and Dora and will carry as many things as she can in her arms. This week she had 5 baby dolls in her arms at one. Usually it's babies but sometimes it's blankets, books, combination of different things. 3. 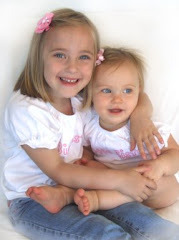 Leah will be turning 5 in couple weeks and we are having so much fun planning her Fancy Nancy Tea Party. 4. It's a balmy 46 degrees outside and it's giving me spring fever today. 5. I'm currently reading The Bible in One Year. I'm determined to actually do it this year but I'm a few days behind. Any random things you want to share with me? Let's just start by saying that it is so pretty outside! 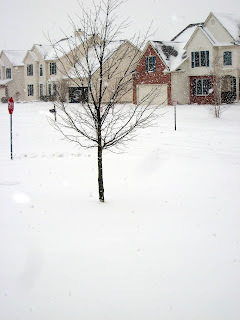 We have inches of snow and huge, falling flakes. We would so be outside playing if Leah didn't have a cold/fever that's kept her out of dance yesterday and school today. Since it's snowy and cold out, plus Leah's a tad under the weather, we had chicken noodle soup for lunch. Nothing too unusual since Leah loves soup. But today I made PB&J on saltine crackers. Have you ever had that? I remember my mom making them for us when we were little. LOVE THEM! Thanks Mom! My girls loved them too. Carly ate almost 3 cracker sandwiches alone! Leah wanted to make her own and she decided to add some apple pieces on hers. Of course I had to try them for her and they were pretty good. It was fun to share something I loved as a little girl with them. What about you? Do you have any special childhood food memories that you have shared with your little ones? I can't believe it's been forever since I've blogged. We've had tons going on from our Disney trip, to Christmas and the New Year. I hope you all had a blessed and joyous holiday season. We certainly did - minus the plane trip home from Disney, but I'll blog about that later! Here are some of the favorite Disney pics so far. 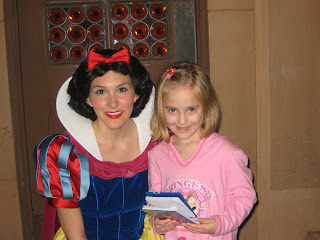 Leah meeting her all time favorite princess, Snow White. 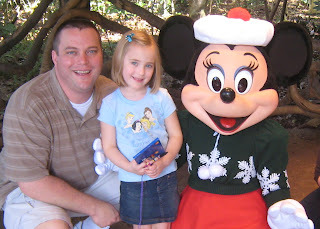 I LOVE this pic of Dan and Leah with Minnie! Carly napping in the stroller. We wore her out most days. Leah and one of her favorite rides - the teacups!